Spectral and output power data of distributed Bragg reflector lasers emitting in the technologically important wavelength range from 780 nm to 1083 nm are presented. These devices are fabricated in a single molecular beam epitaxy growth step, and the gratings are defined by holographic interferometry. Spectral dependencies on the grating and gain section lengths are systematically investigated. Experimental data for the side-mode suppression ratio, mode spacing, and thermal wavelength shift are given for devices emitting in the near infrared wavelength range between 780 nm and 1083 nm. Keywords: Distributed Bragg reflector, laser diode, semiconductor laser. High-power distributed Bragg reflector (DBR) lasers are used in numerous applications requiring both single-frequency and wavelength tunability over a few tenths of a nanometer. Typical applications are Raman and absorption spectroscopy , narrow line pumping of rare earth-doped amplifiers , short pulse generation [3,4], and in numerous sum or difference frequency applications including mid-infrared and long wavelength (THz) generation as well as visible light generation by second harmonic conversion [5,6]. Table 1 shows typical applications for single-frequency lasers in this wavelength range. The ability to fabricate these devices in a single molecular beam epitaxy (MBE) growth step with gratings defined by holographic interferometry significantly reduces device complexity and processing time, thus minimizing manufacturing costs. The DBR lasers currently produced by this method cover the wavelength range from 780 nm to 1083 nm, with output power from 40 mW to around 700 mW, and have outstanding single-mode, high-quality beam spectra. The spectral properties of DBR lasers are of major importance to the above-mentioned applications, and may vary significantly from one specific application to another. Therefore, proper understanding of the interplay between the DBR and the gain sections is a critical requirement for the overall device design. In this paper, we systematically investigate the physical properties of the grating and gain sections to study the impact on the emission spectra and device performance. The detailed spectral characteristics of the 780 nm, 974 nm, 1064 nm and 1083 nm DBR lasers are not limited to these specific wavelengths and may serve as guidelines for other wavelengths. This paper is organized as follows: In section 2, the basic epitaxial structures and manufacturing steps for the DBR laser diodes are presented. Section 3 contains experimental and simulated spectral property data for DBR laser devices. The mode spacing and wavelength shift dependence on device temperature and current, and the Side Mode Suppression Ratio (SMSR) dependence on temperature are investigated for 1083 nm, 974 nm and 780 nm DBR lasers. In section 4, DBR laser performance data are given, including power, spectral, and lifetime data for the studied wavelength range. The summary and acknowledgement for this work are presented in Section 5. The DBR laser structures are processed from MBE grown AlGaAs (InGaAs, GaAs)/AlGaAs/GaAs epitaxial wafers. AlGaAs, GaAs, and InGaAs are chosen for the quantum well (QW) material, depending on the desired wavelength. Graded Index Separate Confinement Heterostructure (GRINSCH) and cladding layers are composed of AlGaAs. The exact Al concentration and layer thickness vary for the different wavelength structures to provide the appropriate QW barrier height required to minimize leakage current. Prior to DBR laser fabrication, photoluminescence (PL) mapping is performed to determine the exact aluminum mole fraction and uniformity across each MBE-grown wafer. The averaged values are then used to derive the exact ridge and grating etch depths required for each structure during fabrication. The DBR laser fabrication steps are summarized below. 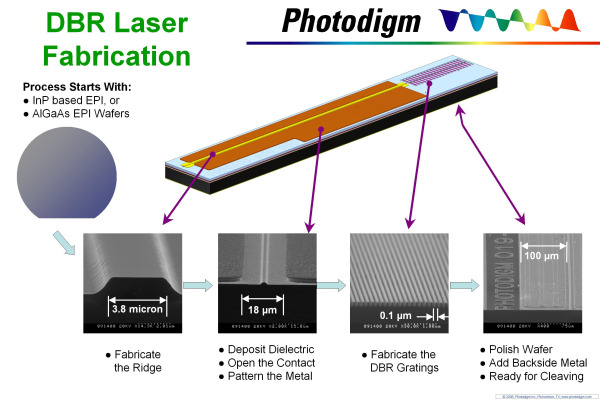 The DBR lasers are processed in two major steps similar to the method in . In the first step, the gain section including the p-metal contact is processed, and in the second step, the grating section is defined. The ridge waveguide of the gain section is formed by a wet etch followed by a self-aligned process for electrical isolation on either side of the ridge. Following p-metal (Ti/Pt/Au) evaporation, a window in the Si3N4 covering the grating region is opened, followed by the deposition of a thin (~500 Å) layer of photoresist. The gratings are formed by holographic lithography with the designed grating period, followed by dry etching to the designed grating depth. Approximate grating periods for each laser wavelength are given in Table 2. Second-order grating periods are used for 780 nm and 852 nm DBR lasers, while first-order gratings are used for longer wavelength lasers. Figure 1. Schematic of typical DBR laser device with SEM photos of key features. After the gratings are defined, a 5 mm wide confinement ridge is formed and etched into the grating sections. Following the confinement ridge, a final Si3N4 layer is deposited to serve as a protective film on the gratings. Final processing steps include wafer thinning to ~100 mm and n-side metallization. The wafer is then cleaved into bars, passivated, and optionally antireflection (AR) facet coated. Bar level characterization includes light output and voltage (LIV), spectrum, and beam profile as a function of injection current. Finally, after individual device cleaving and packaging, the devices are once again characterized. The spectral wavelength variation with respect to current and temperature is significantly reduced after device mounting. Figure 1 shows key elements of the final device structure including the gain ridge, p-type metallization, and the DBR grating section. Typically, DBR laser diodes emit in a single spectral mode located at the wavelength closest to the DBR peak reflectivity, thus requiring the least amount of gain to reach threshold. With increasing injection current, the lasing mode moves toward longer wavelengths. As this dominant lasing mode shifts farther away from the DBR peak reflectivity, an adjacent cavity mode will eventually possess higher reflectivity, and the emission wavelength then jumps to the new mode at a shorter wavelength. This behavior is illustrated in the curves of Fig. 2a for a 778 nm DBR laser. This plot shows that for any fixed temperature, the wavelength for this specific laser slowly increases over an approximate 25 mA current range followed by a “mode-hop” back to a shorter wavelength. The exact wavelength change upon mode-hop depends on the mode spacing, which itself depends on the effective cavity length and the group refractive index as discussed in a section 3.2. Figure 2 (a): Wavelength characteristics for a 778 nm DBR laser with increasing current at temperature steps from 15°C to 50°C; (b) Constant wavelength contours for a 1083 nm DBR laser with increasing current from 10°C to 50°C. Figure 2b shows contours of constant wavelength versus injection current and temperature for a 1083 nm DBR laser. The two vertical curves overlaid in Fig. 2b show paths of continuous, mode-hop free wavelength tuning for constant laser output power. These curves show that through proper current and temperature control, linear wavelength tuning without mode hops can be achieved over large current and temperature ranges. This behavior is easily predictable, and accurate wavelength selection at predefined power levels and temperatures can be achieved by proper gain and grating section design. The cavity modes shift within the DBR reflectivity curve according to changes in the gain section length and refractive index due to carrier concentration changes (via Kramer’s-Kronig relation) and/or by temperature changes. For the 778 nm and 1083 nm DBR lasers shown in Fig. 2, the thermal tuning coefficients are 0.6Å/C° and 0.7Å/C° respectively, while the injection current tuning coefficients are 0.026 Å/mA and 0.017 Å/mA, respectively. The thermal and current tuning rates are similar for other wavelength DBR lasers after AR coating and packaging. One key feature of the DBR lasers presented in this work is that the current tuning rate is approximately half that of typical distributed feedback (DFB) lasers in this wavelength range . The grating sections of these DBR lasers are passive and thus require no complex regrowth step as needed for DFB lasers. Furthermore, this design property significantly reduces current-induced heating effects in the grating section, thus minimizing the wavelength shift due to a specific current-induced heat load. One additional feature of the passive DBR grating section is that propagation of current-induced defects in the laser epitaxial structure are minimized, thus allowing far greater wavelength stability and repeatability over operating lifetime when compared to DFB lasers. where ng is the group index and Ltot is the total of the gain and effective DBR section lengths. Figure 3: Experimental data plotted as inverse mode spacing as a function of gain length for a 974 nm DBR laser. A set of 974 nm DBR lasers were tested by progressively cleaving back the gain sections from an initial length of 1500 mm down to 500 mm. The mode spacing was then measured and averaged over several mode jumps. Figure 3 shows this data plotted as inverse mode spacing as a function of the gain section length. This data is then used with Eq. 3 to derive a group refractive index of 4.587. This group refractive index can then be used to calculate the mode spacing for arbitrary gain section lengths as part of final device design optimization. The same experimental process can be applied for other wavelength DBR lasers to evaluate the group index as part of device analysis. where RDBR(l0) and RDBR(l1) are the intensity reflectivities of the DBR grating at the lasing wavelength (l0) and the side mode wavelength (l1), respectively. With increasing gain length, the threshold gain difference decreases, which decreases the SMSR. The DBR laser spectral dependency on gain length has been investigated for 974 nm DBR lasers with fixed grating lengths in . Here we show the effects of DBR length on the SMSR for 1083 nm DBR devices with fixed gain lengths. The DBR sections were systematically cleaved back from 800 mm to 200 mm lengths in 200 mm steps. The SMSR was then measured at 50 mA, 100 mA and 200 mA current levels as shown in Fig. 4a. Figure 4 (a): Measured SMSR data as a function of DBR length for injection current I = 50 mA, 100 mA, and 200 mA for a 1083 nm DBR laser; (b): Calculated curves for DG as a function of DBR length for grating refractive index contrast values of Dn = 0.001, 0.0015, 0.002, and 0.0025. Figure 4a shows that the SMSR increases nonlinearly with increasing current for constant DBR lengths, and is attributed to spectral and spatial hole burning effects to be discussed in a later work. The calculated curves of Fig. 4b show DG as a function of DBR length for different values of Dn corresponding to the refractive index modulation within the DBR grating section. The differences in Dn are attributable to the physical parameters of the DBR grating section including grating etch depth and duty cycle. By comparing the shapes of the plots in Fig. 4, we find that the experimental SMSR data is best fit with a Dn range from 0.001 to 0.0015, (very close to the original targeted design value for the 1083nm devices in this work.) It is generally observed that high quality single mode operation with SMSR > 40dB can be easily achieved by designing the laser for DG values greater than 0.5 cm-1. High power single mode lasers are in great demand in numerous applications as outlined in Table 1. We have fabricated DBR lasers to meet this need in several different wavelength and power ranges using the methods described in the previous sections. Table 3 gives the typical slope efficiency and maximum power currently available for each DBR laser wavelength. Table. 3. DBR laser performance. For both 1083 nm and 1064 nm DBR lasers, power outputs greater than 500 mW are routinely achievable while still maintaining SMSR over 30 dB after passivation and AR coating. Output powers of more than 700 mW have been obtained from selected 1064 nm DBR laser devices. The 852 nm and 780 nm DBR lasers have only been recently developed, and are still undergoing design and process optimization. The targeted output powers for the 852 nm and 780 nm series of DBR laser diodes are 300 mW and 200 mW respectively. The primary output power limitation for the single mode 780 nm DBR laser diodes has been due to the onset of catastrophic optical damage (COD). Ongoing optimization tasks include refinement of the epitaxial design to reduce the optical power density at the laser output facets by increasing the mode field spot diameter, and the incorporation of non-absorbing mirrors (NAMs) at the output facets. The DBR laser emission spectrum is determined primarily by temperature and injection current, and to a lesser degree, the final laser packaging. It should be noted that under high power operation, large operating currents can contribute significantly to the overall device temperature, thus proper thermal management is required to maintain spectral stability. 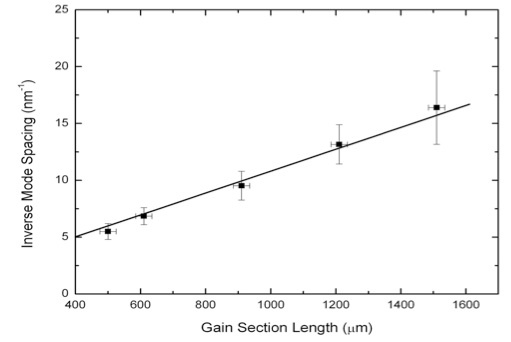 Figure 5 shows the spectral output performance of 778 nm and 1065 nm DBR lasers. The temperature tuning characteristic for a 778 nm device is shown in Fig. 5a. The output wavelength as a function of power (injection current) for a 1065 nm DBR laser maintained at a constant heatsink temperature of 25 oC is given in Fig 5b. Figure 5 shows that the DBR laser diodes studied in this work exhibit high quality single mode operation (SMSR > 40dB) over a wide range of operating current and temperature. The reliability of semiconductor lasers depends on many factors. These include the original epitaxial design, as well as strain and defects that occur during the epitaxial growth. Additional strain and defects can be introduced during the laser processing steps, specifically during photolithographic, dielectric, and metal layer deposition. Secondary failure mechanisms include stresses introduced in packaging, and lastly, the operating conditions and environment. where k is Boltzman’s constant, and Ea is the activation energy, which is determined by the failure mechanism causing the degradation. Generally the range of Ea is from 0.2 eV to 0.7 eV. where Ii is the drive current corresponding to TTFi, and n is the current degradation factor, typically ranging from 1.5 to 2.0. The lifetime testing for the DBR lasers described in this work is performed under constant power conditions where the drive current is automatically adjusted to maintain a constant emitted optical power level over the lifetime of the device. The operating current is recorded over several thousand hours, and the rate of change in the required current is used to project the lifetime of an individual device. Once the time of failure for each device is estimated for a given set of operating conditions, the mean time-to-failure (MTTF) is calculated under the assumption that the failure times follow a statistically log-normal distribution. Current lifetime data is available for the 780 nm, 920 nm, 1064 nm, and 1083 nm series of DBR laser diodes. Figure 6 shows typical lifetime data for 780 nm and 1083 nm DBR laser diodes. These curves indicate that the DBR lasers exhibit robust lifetime performance, with operating temperatures ranging from 25 oC to 85oC under constant power mode test conditions. Table 4 summarizes the estimated MTTF for DBR lasers of each wavelength for room temperature and constant power operation. The MTTF at other operating temperatures and power levels can easily be derived from Eq. (5) and Eq. (6). Figure 6: Sample lifetime data for (a) 780 nm DBR lasers operating with 60 mW constant output power at 25°, 45° and 65°C; (b) 1083 nm DBR lasers operating with 100 mW constant output power at 25°, 55° and 85°C having over 8500 hours of operation. Table. 4: DBR laser lifetime data. In this paper, we present key characteristics of DBR laser diodes grown in a single epitaxial step. This method of fabrication significantly reduces device complexity and therefore manufacturing time and cost. Measured wavelength tuning characteristics of 778 nm and 1083 nm DBR lasers are presented as functions of device temperature and current. We show that these DBR lasers exhibit wide mode-hop free current and wavelength tuning ranges. The group index is determined by performing cleave-back experiments on the gain sections, allowing optimization of the gain length for DBR lasers. Systematic cleave-back experiments on the laser DBR sections allow optimizing the SMSR characteristics of DBR lasers. The SMSR dependence on DBR and gain section lengths and the refractive index modulation of the grating is determined, showing that single mode operation with SMSR > 40 dB can be obtained when the laser is designed to have a threshold gain difference DG greater than approximately 0.5 cm-1. Finally, performance data for the various DBR laser wavelengths show maximum single mode output powers, typical emission spectra, and reliability data. For 1064 nm DBR laser diodes, single mode operation can be maintained to over 550 mW (or higher for select devices) and devices operating at shorter wavelengths perform at consistently higher output power levels than other types of single wavelength laser designs including DFB lasers. Emission spectra show that these DBR lasers operate with SMSR typically in the range of 40 dB to 60 dB over wide ranges of operating power and temperature. Finally, the typical projected lifetime data for the DBR lasers described in this work is on the order of 100,000 hours to over 850,000 hours depending on wavelength. This high performance is directly attributed to the single epitaxial growth process for these DBR lasers. This feature results in a simplified structure that minimizes device complexity, fabrication requirements, processing time, and cost. Additionally, this simplified design results in a passive DBR section that does not suffer from the degradation mechanisms and heating that normally limit the lifetime, spectral quality, and spectral stability of high-power single wavelength laser diodes. The authors would like to thank R. Mangham, D. Phan, J. Threadgill, and P. Le for processing the laser devices. Major, J.S. and Welch, D.F., “Single mode InGaAs/GaAs distributed Bragg reflector laser diodes operating at 1083 nm”, Electron. Lett. 29(24), pp. 2121-2122, 1993. Fukagai, K., Chida, H., Ishikawa, S., Fujii, H. and Endo, K., “High-power 1.02 mm InGaAs/AlGaAs strained quantum well lasers with GaInP buried waveguides for pumping Pr3+-doped optical amplifiers”, ”, Electron. Lett. 29, pp. 146-147, 1993. Hasler, K.H., Wenzel, H., Klehr, A. and Ebert, G., “Simulation of the generation of high-power pulses in the GHz range with three-section DBR lasers”, IEE Proc.-Optoelectron. 149(4), pp. 152-160, 2002. Vasil’ev, P.P., White, I.H. and Fice, M.J., “Narrow line high power picosecond pulse generation in a multicontact distributed feedback laser using modified Q switching”, Electron. Lett. 29, pp. 561-563, 1993. McIntosh, K.A., Brown, E.R., Nichols, K.B., McMahon, O.B., DiNatale, W.F. and Lyszczarz, T.M., “Terahertz photomixing with diode lasers in low-temperature-grown GaAs”, Appl. Phys. Lett., 67(26), pp. 3844-3846, 1995. Hu, M.H., Nguyen, H.K., Song, K., Li, Y., Visovsky, N.J., Liu, X., Nishiyama, N., Coleman, S., Hughes Jr., L.C., Gollier, J., Miller, W., Bhat, R. and Zah, C., “High-power high-modulation-speed 1060-nm DBR lasers for green-light emission”, IEEE Photon. Technol. Lett., 18(4), pp. 616-618, 2006. H. Wenzel, A. Kleha, M. Braun, F. Bugge, G. Erbert, J. Fricke, A. Knauer, M. Weyers and G. Trankle, “High-power 783 nm distributed-feedback laser”, Electron. Lett. 40(2), pp. 123-124, 2004. Coldren L.A. and Corzine, S.W., [Diode Lasers and Photonic Integrated Circuits], John Wiley & Sons, Inc., New York, 1995. Achtenhagen, M., Amarasinghe, N.V., Jiang, L., Threadgill, J. and Young, P., “ Spectral properties of high-power distributed bragg reflector lasers”, accepted for publication in IEEE J. Lightwave Technol., Dec, 2008.